Pink Sugar Bowl: Apple Season and Preserving! It has been awhile since I last posted! This past summer was incredibly busy so I hope to catch up on a few posts I've intended to write. First up is all about apples! The first day of Fall was yesterday and there is no better way to welcome it in than with apples! We picked about 40lbs of Cortland an orchard in Ohio and turned them into apple butter, fresh juice and then froze about two gallons of sliced to use in recipes later this year. This is the first time I froze apples and thought I'd test an age old trick to keep them from turning brown, and it worked! Below are the instructions and a few photos. I had to do all the peeling by hand for the apple butter so you'll see all those frozen still have the skin on them (personally I think when fried they taste better with the peel anyway). Here is a photo of the peeled, cubed apples ready for apple butter and the final result before canning. 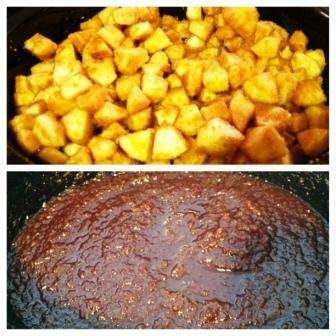 There are many recipes for apple butter but here is the one I used. You'll need a 7 qt crock pot for this amount of apples. Put the water in the bottom of the pot. In a small bowl measure the sugar and spices (adjust spices to your preference). Mix to combine. (I keep one of those McCormick grinders on hand that is filled with crushed cinnamon sticks and grind about 10 - 12 times into the bowl of sugar). Toss apples with the sugar and pour into crock pot. Cook on high for one hour. Turn down to low and cook about 9 - 10 more hours. Stir at least three times during this cooking period. When the apples are easy to mash with a spoon remove the lid and let it cook on low one more hour. Using a whisk break up the cooked apples to desired consistency. Follow traditional canning method to preserve. With some of the left over apples I decided to freeze some for pies, fried apples, muffins and cakes later this winter. First wash the apples (a cool water/distilled white vinegar bath worked well since these were fresh picked and not waxed). After washing, rinse with clean water and set aside. Prepare a large bowl with a salt water bath. Place 1/4 cup salt in a large bowl, add 1 cup of hot water and completely dissolve the salt. To that add about 1 gallon of cold water. Place a clean colander in the sink. Now prep your apples working in batches. Core and slice then place them into the salt bath. Let them rest just a few minutes (3-4 is fine). Transfer to the colander with a mesh strainer or slotted spoon and rinse with cool water. Shake off excess water and place on a rimmed baking sheet. Freeze at least 24 hours then transfer them to a freezer bag. The apples will not be salty so do not worry! I could not believe how well this trick worked and how beautiful the apples looked after freezing! I froze three trays of apples at once then transferred to the bags. This prevents the apples from sticking together. 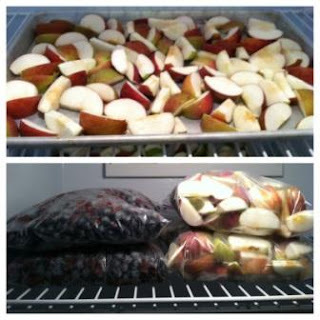 I used that same method of freezing on the tray first before bagging with my blueberries (shown to the left of the bagged apples). 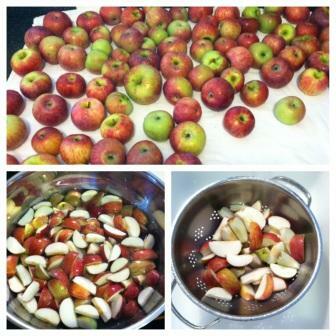 If you plan to preserve apples and want to keep them white give this method a shot, I was very happy with it! Please come back and let me know how it works for you! I'd love to hear about your favorite fall apple recipes so feel free to share!